For many years we have advised and assisted customers who have come to us with their requirements for civic or official insignia, such as chains and badges of office and this page illustrates but a few of the many artefacts we have produced. Each object is individually designed and manufactured with the utmost care. Our knowledgeable and experienced staff are able to offer guidance and suggestions in relation to design, style and materials. We have available to us the skills and craftmanship of excellent silversmiths and enamellers whose work has been admired internationally. 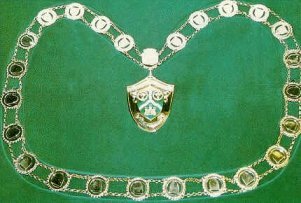 Among the items we have supplied are chains of office; jewels or badges for mayors and their mayoresses and their escorts, past mayors, chairmen, honorary freeman and honorary aldermen; maces; medallions; and lapel badges. Leather or rexine cases, suitably lined, can be provided for the protection of insignia when not in use. We can also undertake repairs and cleaning and produce new collarettes and cases. 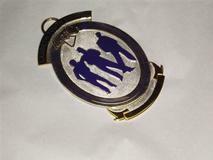 2” engraved medals with a hand painted enamel badge on blue collarettes. 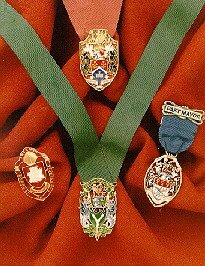 An intricate gold and enamelled Mayoral badge to be worn on a chain. 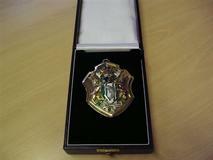 A modern style silver gilt enamelled badge. 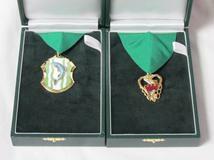 Intricate gold and enamelled Past Mayor and Past Mayoress badges on green collarettes.